Day 2 of UDS! Mark’s keynote from yesterday is now up on youtube, you can view it here. The session started off with some discussion around the use of Trello.com boards. Several teams have found them to be useful and we’ll likely continue use, we do want to be mindful that we’re not duplicating the work of other methods for work item tracking (ie blueprints). There was also some discussion about community documentation which was picked up in a session later in the day. Finally, Jono let us in on EA’s announcement that was supposed to be big news tomorrow but had already leaked to several sources: Electronic Arts now have two games in the Ubuntu Software Center: Command & Conquer Tiberium Alliances and Lord of Ultima (he blogs about it here). For now these are just links to web applications, but it is very cool that a company like EA is showing interest in Ubuntu as a gaming platform. The two biggest take-aways from this session was that they need more user testing and there is a fair amount of work to be done to consolidate and complete packaging documentation. There are several open bugs (here), so there is some feedback coming in, but to continue testing and feedback there was a proposal for user testing at packaging jams. On the consolidation side, there is still an Ubuntu packaging guide on the Ubuntu wiki, so the one on the wiki will be merged into the formal one here. The formal packaging guide is written in Sphinx and they are looking for volunteers to help with the transition. It was also noted that there is a translation infrastructure is available, but there will need to be milestones for when we can do calls from translations, so they began developing some milestones. This session went through reviewing default keybindings in Unity and discussing what worked, what people where having trouble with and how changes can be made to alter how accessible it was. Representatives from the Accessibility team were available to chime in on changes. Throughout reviewed portions of the keyboard shortcut overly to see about whether additions/subtractions need to be made. In this session we did an analysis of SUMO to replace the help.ubuntu.com/community/ moin wiki. There are a lot of complaints about the current infrastructure, including that wikis are difficult to maintain and aren’t really built for the dynamic support documents that organizations like Mozilla have, plus there is no real support for translations. I did have some concerns about who can edit it, particularly surrounding whether moderator approval would be required for edits, unlike the wiki, and who would be responsible for handling the additional moderator burden that such an infrastructure may bring (the docs team is already spread pretty thin!). A test instance will be deployed so we can explore some of this. After lunch it was off to the plenaries! 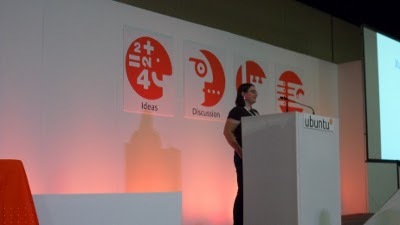 They started out with an Ubuntu at Google presentation with Thomas Bushnell, Tech Lead for Google’s Goobuntu team. He began by hinting at the size of their Ubuntu deployments at Google, saying “tens of thousands of employees” including graphic designers, managers, software engineers, systems engineers, translators and more. They push workstations to their limits, have very high costs for reboots and re-logins. Goobuntu is a light skin over standard Ubuntu in most cases, they don’t customize the UI, use centralized administration with Puppet and apt, LDAP-based user database and automated release testing. He went over some of the special demands based on security, including purging packages which may be dangerous and more secure network authentication, internal apt repository framework and very diverse developers they support. They use the Ubuntu LTS and make extensive use of multiple testing methods and automation. Someone took notes from the plenary which I’ve uploaded here. We then had the official flavors planery, where representatives from Kubuntu (David Wonderly), Xubuntu (me! ), Lubuntu (Julien Lavergne), Studio (Scott Lavender) and Edubuntu (Jonathan Carter) gave quick updates on the status of their respective flavors. Thanks to Benjamin Kerensa for taking a photo during my Xubuntu section! 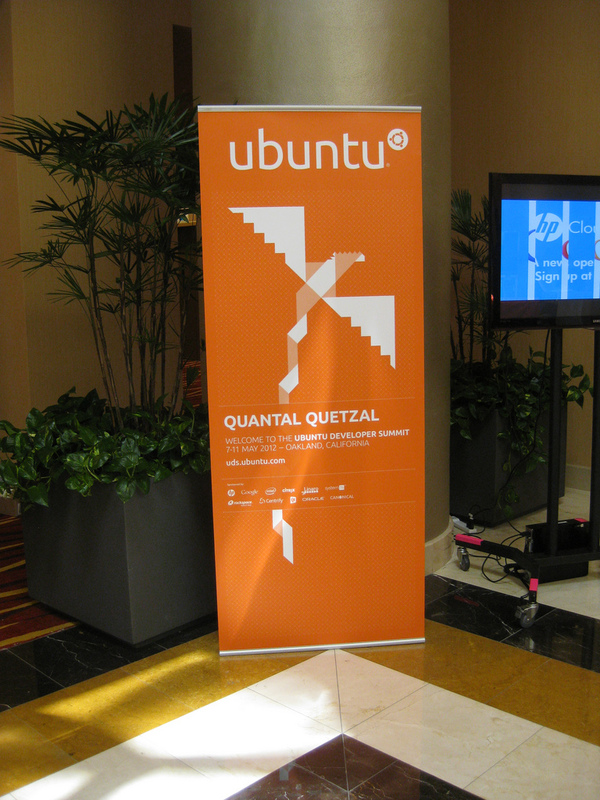 The plenaries wrapped up with Jono Bacon discussing his journey creating the new Ubuntu Accomplishments system. The rest of the afternoon was spent at the leadership summit. It was a small group and some of the topics we covered were nurturing leaders, handling conflict, best practices for leadership. The final hour ended up being quite a valuable time, with some of the core community contributors sharing personal stories about their rise into leadership within the project and some of the challenges they faced and lessons learned. I think one of the key take-aways is that some of our core struggles around recruiting and retaining great volunteers are very similar, and for every time we cast our net out for contributors there will be only a tiny percentage of that group who will be retained, whether due to changing interest, time constraints or other factors which prevent prolonged involvement. I had some great “hallway discussions” before heading down to the Google-sponsored “Circus” themed party. All I want to say about the party itself right now is that it made me uncomfortable, I left pretty quickly. Instead I went with Michael Hall, Penelope Stowe, Alan Bell and Jamesha Fisher over to a sports bar down the street where we enjoyed beers and some sandwiches, which was quite enjoyable! 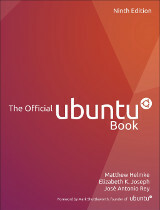 This entry was posted on Tuesday, May 8th, 2012 at 11:29 pm and is filed under events, tech, ubuntu planet, UDS. You can follow any responses to this entry through the RSS 2.0 feed. Both comments and pings are currently closed.